Lot Detail - Ron Schock's 1972-73 Pittsburgh Penguins Game-Worn Alternate Captain's Jersey - Team Repairs! Ron Schock's 1972-73 Pittsburgh Penguins Game-Worn Alternate Captain's Jersey - Team Repairs! 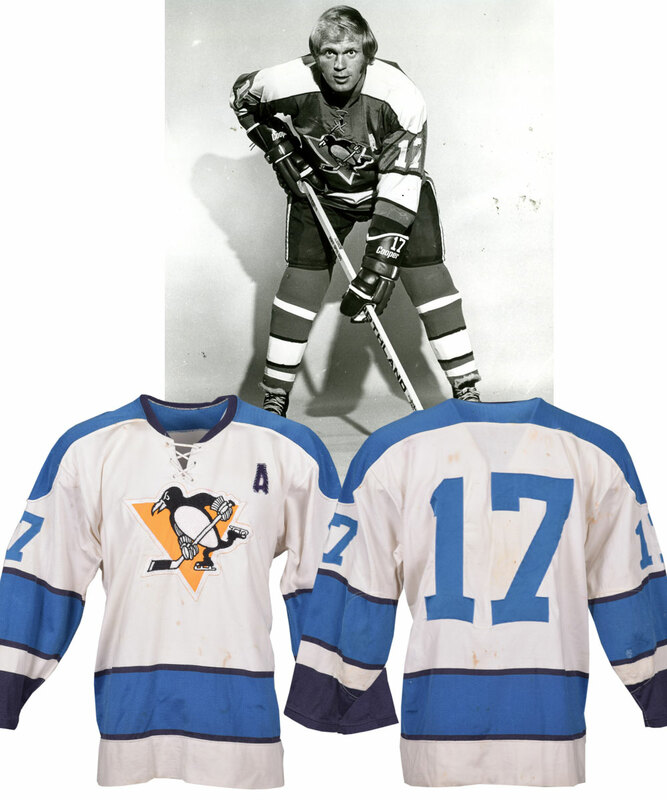 Glorious vintage durene jersey is Ron Schock’s 1972-73 Penguins game-worn alternate captain’s jersey. The chain-stitched black, white and gold skating penguin crest is sewn on the front of this tie-neck beauty with its original lace which has a crudely-sewn “A” on the left breast and six team repairs. Schock, who was named Penguins captain the following season, played the majority of his 909-game NHL career with Pittsburgh, where he played eight straight seasons from 1969-77. Rawlings size 48 tagging is sewn on the left inner hem and a garter-style fight strap is in the back. More game wear features various reddish-brown stains on the front, back and both sleeves, and board burns and pilling. There are two team repairs low on the right sleeve, one on the left front tail, and three more on the left sleeve. The board burns are on the sleeves and shoulders, and there is orange paint transfer on the back of the upper right sleeve at the seam with the right upper back, and red paint transfer on the top of the Penguins crest on the front, and to the right of the numbers on the right side of the back.